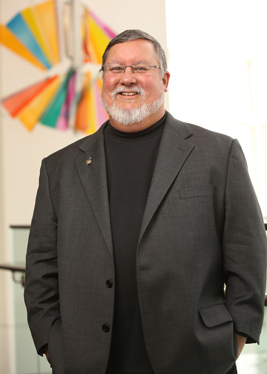 Craig Sellers is a widely-recognized educator, researcher, and author who directs the School of Nursing master’s programs, including the nurse practitioner and leadership programs. His four decades as a nurse practitioner — providing primary care for people with HIV/ AIDS and older adults — are integral to his teaching and research. He practices in Strong Memorial Hospital’s Emergency Department. An expert on qualitative research methods, he is known for his ability to teach students how to apply these methods to their work. Sellers, who earned his PhD from the UR School of Nursing in 2009, works to ensure that the master’s programs are rigorous, aligned with health care needs, and fulfill the core competencies of various specialties. He is a fellow of the American Academy of Nurse Practitioners and a member of several professional nursing organizations, including Sigma Theta Tau International Honor Society, National Organization of Nurse Practitioner Faculties, and the American Nurses Association. What helps or hinders people with HIV or AIDS to make decisions about advance directives and guardianship? Advance Directives and HIV/AIDS: What Does the Research Tell Us and How Can We Improve Clinical Practice? Baggs, J. G., Schmitt, M. H., Prendergast, T. J., Norton, S. A., Sellers, C. R., & Quinn, J. R. (n.d.). Understanding attending: ICU attending physician role and decision making at the end of life. .
Quinn, J.R., Schmitt, M.H., Baggs, J.G., Norton, S.A., Dombeck, M.T., & Seller, C.R. (2012). Family members' informal roles in end-of-life decision making in adult intensive care units.. American Journal of Critical Care, 21 (1), 43-51. Young, A., & Sellers, C. R. (2010). Nursing education: What's new in the healthcare literature?. Journal of the New York State Nurses Association, 40 (2), 27. Sellers, C. R (2010). Progressive multifocal leukoencephalopathy (PML). In B. A. Swanson (Ed. ), ANAC's core curriculum for HIV/AIDS nursing (3rd ed. ), 93-96. Sellers, C. R., & MacIntyre, R (2010). Ethical and legal concerns. In B. A. Swanson (Ed. ), ANAC's core curriculum for HIV/AIDS nursing (3rd ed. ), 384-391. Sellers, C. R. (2010). Review of the book Ending nurse-to-nurse hostility: Why nurses eat their young and each other. Journal of the New York State Nurses Association, 41 (1), 14. Sellers, C. R. (2009). What helps or hinders people with HIV or AIDS to make decisions about advance directives and guardianship?. International Journal of Qualitative Methods, 8 (4), 24. Sellers, C. R. (2009). Advance directives and guardianship planning by people with HIV and AIDS: A grounded theory. International Journal of Qualitative Methods, 8 (3), 30. Lunney, M., & Sellers, C. R (2007). Frameworks for change [Editorial]. Journal of the New York State Nurses Association, 38 (1), 3-5. Baggs, J. G., Norton, S. A., Schmitt, M. H., Dombeck, M.T., Sellers, C. R., & Quinn, J. R (2007). ICU cultural environments and end-of-life decision making. Journal of Critical Care, 22 (2), 159-168. Norton, S. A., Baggs, J. G., Schmitt, M., Sellers, C. R., Quinn, J. R., & Dombeck, M.T (2004). ICU family meetings for adults near the end of life: Unpacking a common intervention. Journal of Palliative Medicine,, 7, 160. Baggs, J. G., Norton, S. A., Schmitt, M. H., & Sellers, C. R. (2004). The dying patient in the ICU: Role of the interdisciplinary team. Critical Care Clinics, 20 (3), 525-540. Sellers, C. R., & Angerame, M. C (2002). HIV/AIDS in older adults: A case study and discussion. AACN Clinical Issues, 13 (1), 5-21.